In 1971, Annalee decided it was time to add a little Irish to the springtime collection! 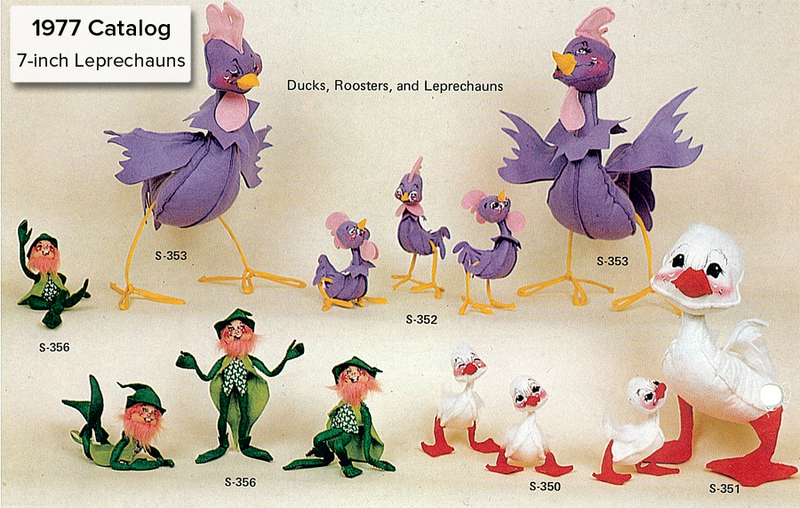 The 7-inch and a 12-inch leprechauns became a staple. They had varying face art just like the other dolls in the line- some sweet and some mischievous! In 1974, she added leprechauns headpicks and pins and cardholders(above). 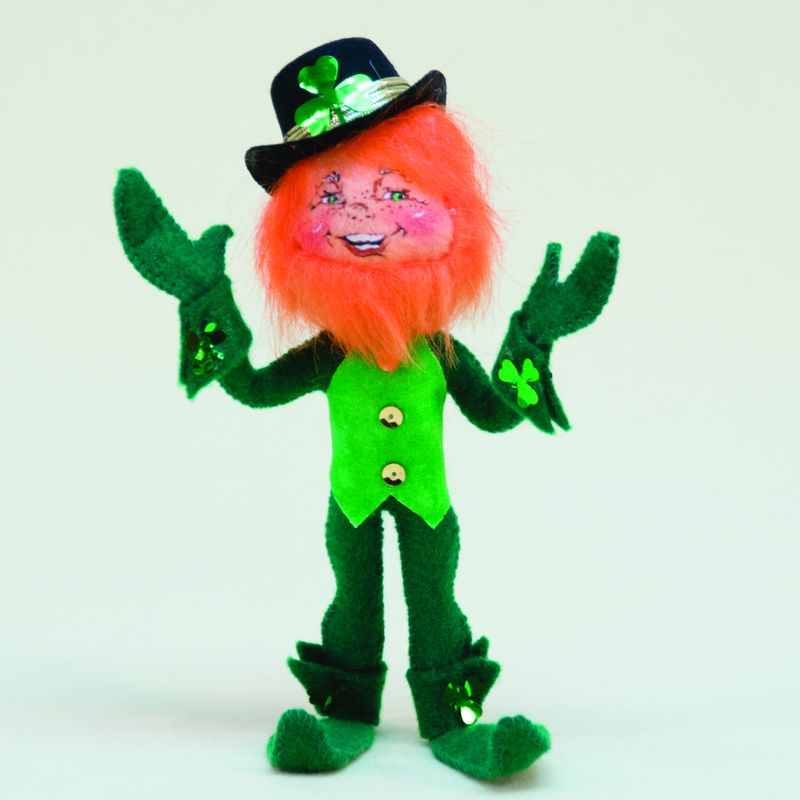 Until the late 80s, the 7-inch and 12-inch leprechauns’s styles changed very little. They always had the green felt bodies and hats and chartreuse coat with bright orange hair and beard! They were distinguished by the print on the vest underneath the coat, but generally the same style vest, jacket and hat was produced over several years. Sometimes the leprechaun would be carrying a burlap sack with or without patches, inside the pouch must have been the lucky leprechaun’s stash of gold coins! Annalee always encouraged creative positioning of the dolls. The leprechauns would be playfully positioned so that one leprechaun may appear as several different designs to the untrained eye- like those below! The Irish collection grew to three styles in 1997 and four by 1999. What was once a leprechauns only line was expanded to include mice, kitties, people-type figures and other animals such as frogs, donkeys and dogs! The designs ran the gamut of all things Irish. From kelly green felt, tweed and cable-knit fabrics to accessories like gold coins, shamrocks, horseshoes, pots of gold and steins of beer- they did it all! There have been whistle and drum playing pixies, jolly gentlemen, drunks and dancers. Let’s not forget the Dublin Donkey and the Irish Setter, made as animals started becoming more and more popular among collectors. The St. Patrick’s Day collections since the turn of the century have consisted of between about six and ten styles and have contained a combination of leprechauns, mice, animals and people. While the popularity has grown over the years, the Irish designs have remained the smallest theme among each year’s collections. Here are some favorites from the past decade! Check out the 2016 Irish Collection!